VOLUME 13, ISSUE 2 -- Photos Soon! 13th Annual Hog Killin' Time Barbecue Tops 'em All ! SMUTEYE - On a recent (rare) sunny day, guests arrived in Smuteye from near and far to attend the 13th annual Hog Killin' Time Barbecue. 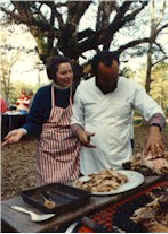 Major and Margaret Cox host this whole-hog barbecue each year for friends and guests at their Bullock County farm. Major's great grandfather started the Hog Killin' Time Barbecue tradition early in the last century. Then, this annual gathering provided him an opportunity to identify the workers that would help him harvest his fields of cotton. Today, the Coxes host this event to celebrate Major's birthday (this is his sixty-second) and to celebrate friendship in this very diverse group. Major's brother-in-law, Larry Oestreich, who traveled from Cincinnati with Margaret's sister, Marianne Meier-Oestreich, and their daughter, Anna Margaret, assisted Wayne Jones, captain of the pig roasting team. Dalton Kuder and his wife, Robin Moore, also assisted with roasting. Dalton, Margaret and Major's longtime friend and flight instructor when they lived in Puerto Rico, returned for the event. They arrived by private airplane from their home in Corpus Christi, Texas and landed at the airport in nearby Troy, Alabama. Greer Geiger of Birmingham also assisted with roasting. The team also helped Margaret prepare and serve fiery chili from an 80 gallon cast iron cauldron. Chick Cleveland returned as bonfire master. He came with his wife, Fran Cleveland, daughter, Susan McCarron, and a cadre of their grandchildren. Mike Sherman headed the pig carving team, assisted by John Moore, they came with their wives, Anita Sherman, and Paula Moore. Robert Holmes and his wife, Camelia Holmes, arrived early from Birmingham to grill chicken and sausage. Anderson Scott from Atlanta returned with his family. He is a talented photographer who has captured the ambiance of this event in the past for the web site. Major’s longtime friends, Jim and Viv Stumbles, came from their home in Seattle, Washington. This was a reunion of two men who first met in Brighton, England at the 1976 World Association of Detectives Convention. At that time Stumbles resided in Johannesburg, South Africa where he headed a private security company and Cox operated a detective agency in Cincinnati, Ohio. The Stumbles spent two days at the Cox’s, enjoying Hog Killin’ hospitality and reminiscing past adventures that span three decades and as many continents. Others joining in the festivities from Montgomery included: Arlam and Johnnie Carr and Montgomery's mayor, Bobby Bright, who came with Larry Armsted. Don and Ursula Nolte brought an officer from Botswana, whom they are hosting for the International Officers School at Maxwell Air Force Base. Also attending were Bobby and Carol Black, Jim and Jane Larose, Hobson and Ramona Cox, Greg and Deborah Griffin, David and LaDonna Brendle, Nick and Gayle Parker, Susan Harwood, Dorothy J. Frazier, Tom Chalfant, Wesley and Merlin Newton, Margaret Carpenter, Glen and Debbie Clark, Jerry and Mary Weidler, Richard Cohen, Mary Lee Stapp, Mack, Nick and Estella Jernigan, Henrietta McGuire, Jim and Cathy Conley, Scott and Sue Garland Binion, Chris Gelhaus and Jamie Glass, Larry and Marge Grewelle, Anna Marjorie McGee, Annette Reid, and Jim Wilson. Those attending from Bullock County included Emma Tate, Wilbert and Margaret Jernigan, who came with son, Jeff, Ira Cox, Lensie Pride and John McGowan. They were joined by Major's neighbor and cousins, Alfredo and Catherine Cox, George and Ruth Jenkins.